Of the 401 political prisoners that President Rodrigo Duterte inherited from the previous administration of Benigno Simeon “Noynoy” Aquino III, 328 still remain in prison. Most of those who got released were due to the efforts of their lawyers or had over-served their time. Two died in detention; one during the height of Duterte’s promise to release political prisoners. Duterte kept on promising the release for almost a year, saying it was a matter of justice, adherence to Philippine courts’ jurisprudence and affirmation of previously signed agreements in the peace talks of the Government of the Philippines (GRP) and the National Democratic Front of the Philippines (NDFP). In spite of the administration sounding like a broken record, 121 have been arrested and detained under the Duterte regime on trumped up charges. Currently, there are 449 political prisoners. In 2016, twenty political prisoners walked free due to their cases being dropped or dismissed for lack of basis, through the defense of people’s lawyers and assistance of human rights groups. Three of them, Rico Bodino (Iwahig Prison and Penal Farm), Dindo Absalon and Bonifacio Suyom (Leyte Regional Prison), and Martin Villanueva (New Bilibid Prison), were released on presidential pardon on December 2016 whose names have been recommended to the Presidential Committee on Bail, Recognizance and Pardon (PCBREP) since 2011. Far from the general amnesty sought with Duterte, only two political prisoners were released but through pardon laid even before Duterte became president. Villanueva and Bodino, detained since 1996 and recommended for parole since 2011 by the PCBREP. Through the efforts of their lawyers, since Duterte came to office, more than 70 political prisoners detained during the time of Noynoy Aquino as president or earlier were released, again through the efforts of people’s lawyers and human rights workers. Even as Duterte’s administration was still promising releases, around 35 new political prisoners were detained by May of this year. That number has now more than tripled to 121. Karapatan data also showed that from July 2016 to November 2017, showed 924 cases of illegal arrest without detention. Meanwhile, there were 256 illegal arrests with detention. The last and only release of political prisoners by the GRP in line with the peace talks were in August 2016 before the 1st round of talks started where 19 NDFP consultants were released to enable them to participate in the peace talks. The release of the consultants was in adherence to previously signed agreements in the peace talks of the GRP and NDFP. As the promise diminished and Duterte turned the table on the revolutionaries for asking too much (read: for the president to follow the country’s own laws and signed agreements), he favored the release of the elderly for Christmas, as well as the sickly and those who had been in jail too long. He said it was also to decongest the jails. However, the administration’s own efforts for these were for naught. Around this time last year, or the week prior the observance of International Human Rights’ Day, political prisoners and their families and supporters held a nationwide hunger strike in various jails and protest centers around the country, with peace negotiators and Duterte himself only assailing the action to be pressure tactic. But the winds have changed. Duterte now repeatedly called for a crackdown on activists groups and mass arrests that he tagged as legal fronts of the Communist Party of the Philippines (CPP), the NDFP and the New People’s Army (NPA) that he has proclaimed as a terrorist organization, taking after the US whom last year he threatened to break ties. And while the manual of the counterinsurgency plan of the administration Oplan Kapayapaan continues to be withheld, Duterte’s pronouncements are but an indication of another regime of violations of the democratic rights of the people. Bernabe Ocasla, 66 years old, a political prisoner for nine years died in Jose Reyes Memorial Hospital in Manila after his third and fatal cardiac arrest on November 28. He was in coma for three days after his blood pressure increased due to hypertension. respondents—including Benito and Wilma Tiamzon, Randall Echanis, Rafael Baylosis, Vicente Ladlad and Adelberto Silva—to a multiple murder case from a mass grave in Hilongos, Leyte filed by the Armed Forces of the Philippines. He was arrested in 2007. He was noted cuffed to his hospital bed as he was struggling in his last moments in life. Ocasla was among the 401 political prisoners listed as one of the the priorities and submitted by Karapatan to the GRP and NDFP to be considered for release, following signed agreements by both parties in line with the peace talks. Another ailing and elderly political prisoner died under Duterte’s watch. He was also arrested during Duterte’s term. Marcos Aggalao, 74, died on Sept. 12 while in detention at the Kalinga Provincial Hospital. Aggalao suffered a stroke three times while in detention, the last on August 29. The court ordered his release on a bail of P100,000. He was not released because trumped-up charges were filed against him anew in Baguio City, while charges in Kalinga were dismissed. He faced eight trumped-up charges of murder, frustrated murder and robbery. He was a peace-pact holder of the Salegseg tribe, and was part of the massive campaign against the Chico River dam project during the Marcos dictatorship. Karapatan said Aggalao suffered from dementia and hypertension and was sick with pneumonia when soldiers of the Philippine Army’s 503rd Infantry Brigade arrested him on Sept. 10, 2016 in Gawaan, Balbalan, Kalinga. Ocasla and Aggalao’s stories were among the most telling of the injustice of a system that creates political prisoners. 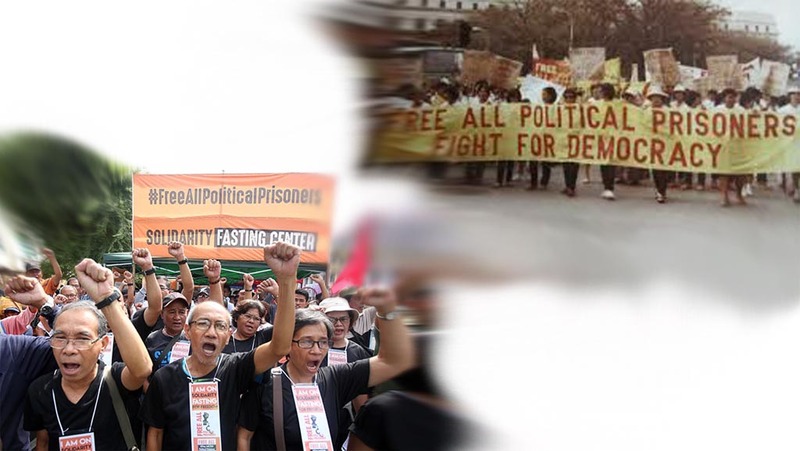 The existence of political prisoners in the Philippines did not end after the Martial Law in 1972 until the fall of the dictator Ferdinand Marcos, Sr. in 1986. There were 70,000 or more were detained without sufficient cause or warrant in the late dictator’s rule. It was then only sufficient for the soldiers, police and other arresting authorities to arrest and detain anybody who oppose or speak against Marcos, even people of varying convictions. Political prisoners, by definition, were those who have been arrested, detained and imprisoned for their political beliefs, association and/or action. While there are laws and the Constitution in the Bill of Rights contravene the occurrence of political prisoners, Marcos’ Martial Law or the 1986 post-Martial Law democracy both saw fit for government to jail people of opposing beliefs and actions and political associations. From the 1986-1992 presidency of Corazon Aquino, who succeeded Marcos, administrations have practiced the criminalization of political offenses, which violates the Hernandez Doctrine. Satur Ocampo and wife Bobby Malay were among the first hit by such practice, with charges against them dismissed after three years. . The Hernandez Doctrine came from Supreme Court decision in the case People vs. Amado Hernandez that ruled that rebellion cannot be complexed with other crimes, such as murder and arson and that rebellion in itself would include and absorb the said crimes, thus granting the accused the right to bail. Labor leader Hernandez, who would later be named National Artist for Literature by the Philippine government, was acquitted by the Supreme Court in 1964. Military and police, since the presidency of Gloria Macapagal Arroyo (2001-2010), charged activists with heinous crimes or non-bailable crimes. The deaths of soldiers at war with the NPA were charged to activists as murder or multiple counts of it depending how many died, sometimes even implicating one activist in NPA encounters in Compostela Valley in Mindanao and then in Cordillera in the north at the same time. Ridiculous as it is, it is not laughable. A political prisoner may spend a decade or more in jail for these trumped-up charges. The trumped-up charges provide the legal basis for their arrest and detention, keep them in detention as the heap of charges take years to be dismissed, as well as paint political prisoners as common criminals. On the average, human rights workers and lawyers noted that political prisoners walk free after three years of litigation until charges were dismissed for lack of basis, proving further the charges were trumped-up. Still, those were all time lost and the justice system provides no reparations for the wrongly accused, more so for the wrongly arrested and detained on the state’s own fabricated charges. Various political prisoners have been tried for the same crime for decades, such as the much-used mass grave in Inopacan, Leyte, where even former Bayan Muna Representative Teddy Casiño was charged, only 10 years of age at the time of the supposed crime. The presidency of Gloria Macapagal-Arroyo saw the detention of 317 political prisoners, including the infamous arrest of 43 health workers undergoing training for community health services in Rizal. All of the political prisoners during Arroyo’s time were said to have been tortured, physically and/or psychologically. The rampage of arrests, but more so extrajudicial killings, in Arroyo’s time was in conjunction with the brutal counterinsurgency plan of her administration, Oplan Bantay Laya 1 and 2, that saw and treated unarmed activists no different from armed combatants. The 2010-2016 presidency of Noynoy Aquino, son of prominent anti-Martial Law figure and Martial Law political prisoner Senator Ninoy Aquino, saw the rise of political prisoners with the rather more seemingly permissive counterinsurgency plan, Oplan Bayanihan, but was known for grave human rights violations in indigenous peoples’ communities. In his six-year term, 284 were detained. The president and his spokespersons denied that there are political prisoners in the country, not even one, touting the line that they were detained for heinous crimes making their incarceration not political. Arroyo jailed 317, Noynoy 284 and Duterte in just 16 months: 121. Duterte’s declaration of crackdown on activist groups sound like Arroyo’s, while Martial law and mass arrests reads like a page from the book of Marcos. The two former presidents were, notably and arguably, his allies, mentors and/or idols. While administrations change and loyalties shift, there is but a continuing narrative. It is one that is most downplayed, yet most vilified, attacked and much resources poured on. It is the people’s struggle for genuine democracy and freedom—a system where tillers have lands, workers have productive and well-paying jobs and do not have to find jobs abroad, children and youth secure to finish education, a sufficient number professionals serve the country, local businesses able to thrive and compete on the international level, national minorities flourish in their ancestral lands. A regime where there is land reform, food sufficiency and national industrialization, where destructive mining is absent, public utilities and social services adequate and a lot more. Free from foreign territorial and economic incursions, especially from the US, that have prevented all these from happening. What should have been the foundations of a democratic society now sounds like a utopian dream, for the people has long suffered from far too less and much worse. Political prisoners were made so, tainted as criminals and separated from the cause of genuine democracy and freedom. It is a cause much bigger than each of them alone, and even far more overreaching than what this country has ever dared to, able to achieve in the current system. We have to keep on telling their stories and their cause that the state held against them. The threat of jail is a cruel joke to one who is not truly free. Amid the threat of crackdown and mass arrests, the promise of a better future remains more inviting to a lot of awakened, conscious people who are willing to work for it.